Unlike our last event, "The Traverse," the Toad Festival participants did not have to deal with temps in the low 100's. The day was beautiful with temps on the Main Divide in the high 70's to low 80's. And for the first time in nine years, the Toad Festival sold out! Although this is considered a fun event, the course is not a walk in the park. Holy Jim has something like 3200+ feet of climbing and the average grade is 7 percent. 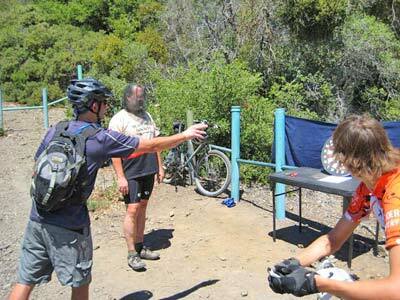 The steepest climb on the Main Divide is 17 percent and 15.5 for something like 1/2 mile. 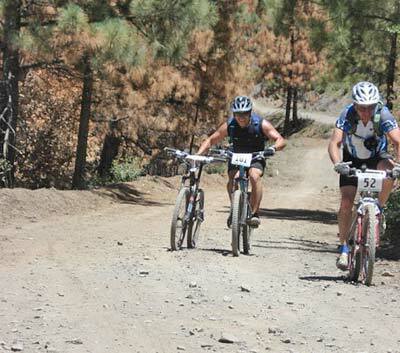 The total distance is 27 +- miles with around 5,000 feet of climbing. 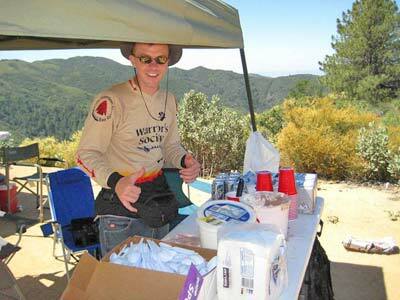 But if you made it to West Horse Thief you were treated to root beer floats! Kids, parents and new riders had a great time on the 10 mile course as well! 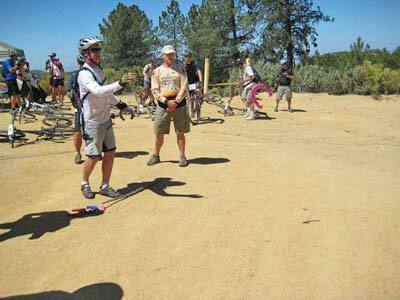 The 10-mile course took participants on a beautiful ride through the O'Neill Park Open Space. The majority of the participants negotiated the course without problems but we did have one participant, Matt Tawney, go down on the Main Divide between West Horse Thief and Trabuco. His crash resulted in a destroyed helmet, slight concussion and scratches and bruises. 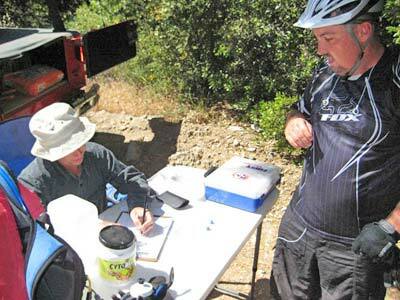 Other participants assisted him until he was driven to the check point at Trabuco, including participant Jose Valez who "ghost rode" Matt's bike to the check point. Safety Officer Lare-Dog did an initial analysis of Matt's injuries and transported him back to the staging area. Luckily, after later being checked out at the hospital, Matt was diagnosed with a slight concussion and emailed me the next day to let me know he'd be back on the bike (after purchasing a new helmet). I was also emailed after the event by a motorcyclist who went down and wanted to thank the mountain biker (Scott Siino) who helped him and checked to see if he was OK. Scott also rode ahead to get help for Matt when he went down. 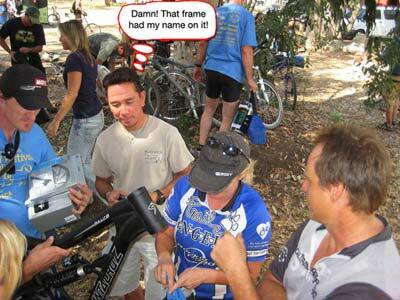 We have a great community of mountain bikers! We are very grateful to our 2008 major sponsors Shimano, Rock N Road, Sho-Air, Clif Bar, Switchback Cyclery, and "The Other Room." 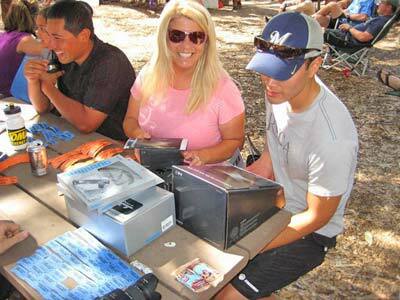 The lunch provided by Major Sponsro El Pollo Loco saved us around $1,500, which also means more money for TACA. For a complete list of our minor and contributing sponsors check out the sponsors page on our web site. Barry Wood, our Graphics Director and Web Master came through with another great t-shirt design (he never ceases to amaze us with his t-shirt designs and web design skills). The staff at O'Neill Park is the best and they have been a big help with our 2008 events, including the Toad Festival (they even participated by buying raffle tickets). After event expenditures, will expect we will have raised between $4,000 to $6,000 for Talk About Curing Autism Now (TACA). 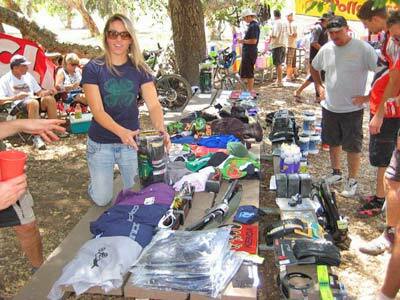 And no funds would have been raised without the support of the mountain bike community that participated in the event. Next year the Toad Festival will be a fundraiser for the Marine Corp Wounded Warrior program at Camp Pendleton which aides our soldiers wounded in action. 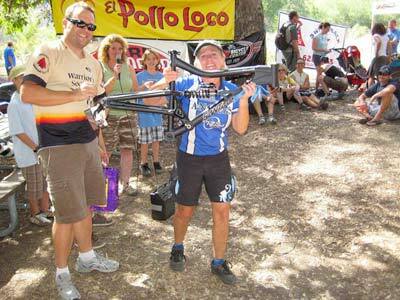 Scott Balgio - $50 Newport Rib Co Gift Certificate donated by Newport Rib Co.
Linh Tran - Crank Bro. Acid 2 pedals- donated by Troupe Racing Co.
Jim Stewart - Ergon BD1 Backpack - donated by Troupe Racing Co.
Jim Simescu - Crank Bro Eggbeater SL pedals - Troupe Racing Co. Thanks again for your support and contributions to a great cause! AKA "Dances With Hornets" and "Stands Her Ground"